So I was terrible at the 52 weeks challenge. Are we surprised? Nope. 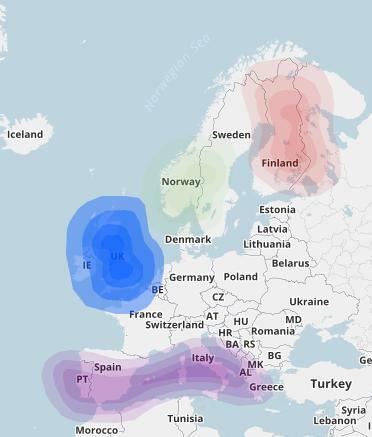 But anyway, with the increase in it's database Ancestry's DNA estimates are being refined so I thought I'd have a look and see what these new estimates look like compared to the old. 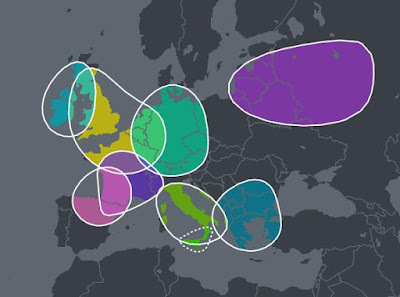 Given what I know of our geographic ancestry none of these changes are particularly surprising, except for that giant purple blob added to Mum's that represents the Baltic States. "disappeared and was probably murdered by aborigines in the St Clair region near Singleton"
Well, at least that's what the family stories say. Jesse Friend was born in Salehurst, Sussex in 1817 to Jesse Friend and his wife Mary (nee Crittenden) and one of seven children. Records suggest that the family was often at the mercy of the Poor Law Union and it was thus that in 1839, Jesse the younger, his wife Mary (nee Baker) their child of 6 weeks and various other relations and in laws were shipped off to New South Wales as part of the 99 souls sent by the Salehurst Poor Law Union on the Neptune. The couple settled in the Maitland area of New South Wales and a second child, Sarah, was born in 1854. 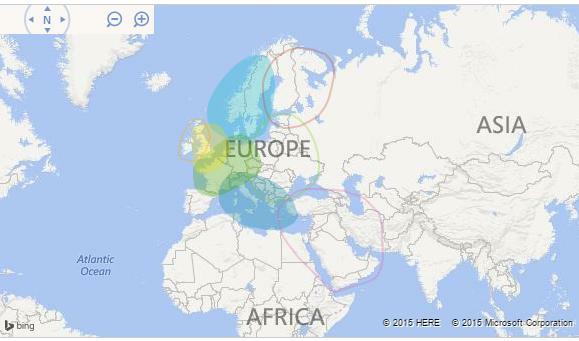 Somewhere between that birth and the marriage of Sarah to James Nash in 1869 we lose Jesse. As is, he disappears from the records. Or at least this Jesse does. The tale is muddied by the presence of other Jesse Friend's in the colony, Jesse the Elder arrives in 1855 under the sponsorship of Thomas King husband of his daughter Mary Ann (one of those relatives also on the Neptune) and there is also a Jesse Friend settled in the Monaro district who is often conflated with 'our Jesse.' The latter's extensive criminal records make him somewhat easy to rule out. 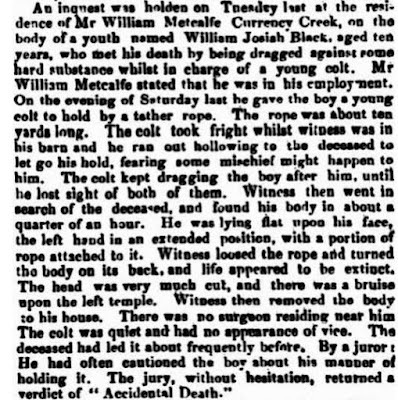 Now if 'our Jesse' he was 'murdered by aborigines' as the story suggests, wouldn't I be able to find some sad tale narrated in a newspaper of the time? I have a rather sneaking suspicion that the true tale may have something to do with goldfields and abandonment but that too I can find no record of. So Jesse Friend is my challenge because I'd rather like to know what happened to him. I have blogged about this little nugget before, and it is of course much disputed as these things are, but I thought it might be interesting to discuss who exactly this white boy of black parents was. William Josiah Black was born on the 2nd of February 1837 'not far from the old gum tree' to William Edwin Black and his wife Mary Ann (nee Bird). The couple had married a few years earlier in 1833 in a recently completed St Dunstan-in-the-West. In September 1836 the couple embarked on the Coromandel bound for Adelaide, South Australia with their 22 month old daughter and William's brothers James and Thomas and their families. The ship arrived in Holdfast Bay on the 17th of January 1837 and William Josiah was born less than a month later. 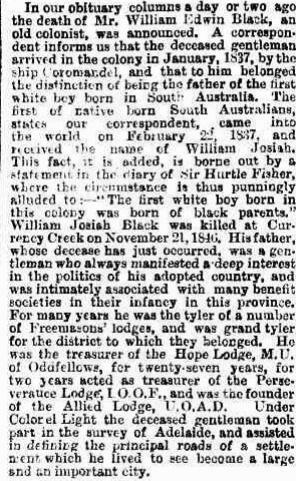 I have seen argued that this makes him the first white male born after Proclamation and not the first first white male born in South Australia, but whatever the case William Josiah was not destined to have a long and fruitful life. 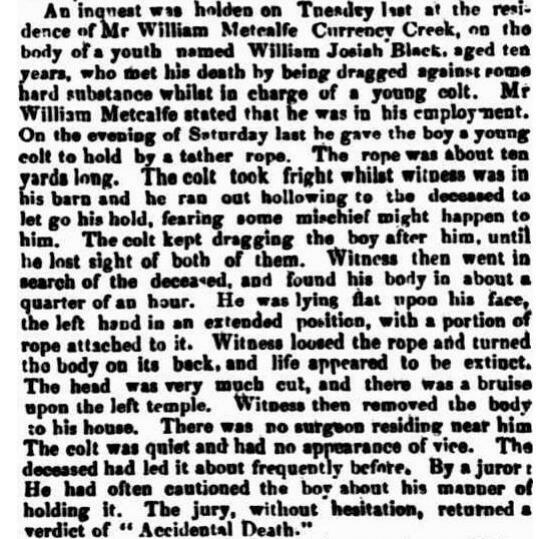 On the 21st of November 1846 young William Josiah was killed at Currency Creek while employed by William Metcalf. 9 years seems to us to be a very young age to be employed outside the home but it was common in the 19th Century for vocational training to start from around 10 to 11 years (and sometimes as early as 7) and for apprenticeships to be entered into not much later. William Josiah's mother had died in August 1844 (a younger sibling John Frederick died in the April of the year at less than a year old) and William Edwin had remarried in the November. Caroline Elizabeth (nee Warren) would give William Edwin a further three children. Edwin in 1845, Louisa in 1847 and Edward Warren in 1848. William Edwin Black was proud of his son's claim to be the first white boy of the colony and it is this distinction that is noted within Notable South Australians, or, Colonists - past and present and The founders of Australia and their descendants and within obituary's and again whenever the subject arose and always a matter of debate. "Are we related to Nancy Bird?" 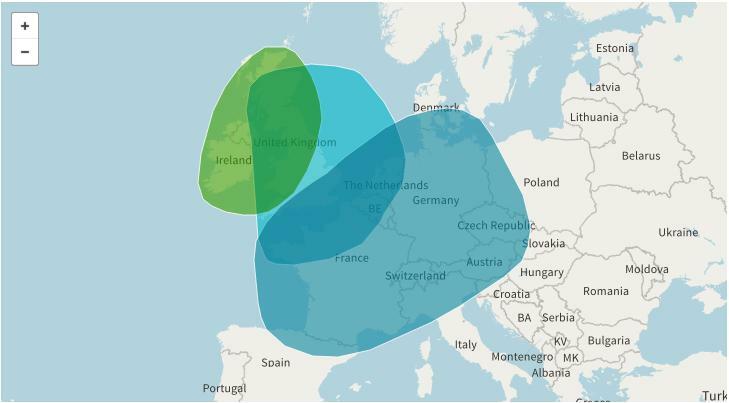 My answer - "Well Nana says so but I am not sure how" was met with little satisfaction on the part of the questioners, so for those who wished for further elucidation on the topic, here is a more extended answer. Is this Nancy Bird's place in the background? 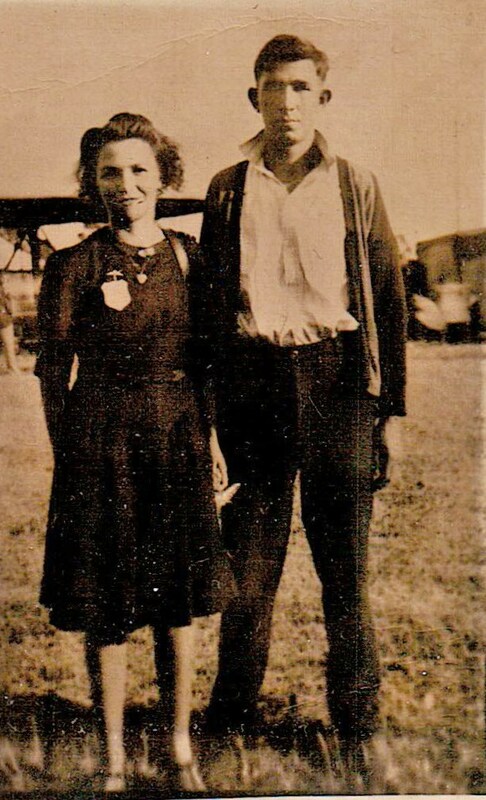 For those of you who may not know, Nancy-Bird Walton was a pioneering Australian Aviator who operated an Air Ambulance service in Outback NSW, founded the Australian Women Pilots' Association, was patron of numerous charities and was one of those people considered to be national treasures. Basically she is the the kind of person that if you find in your tree you tell everyone. 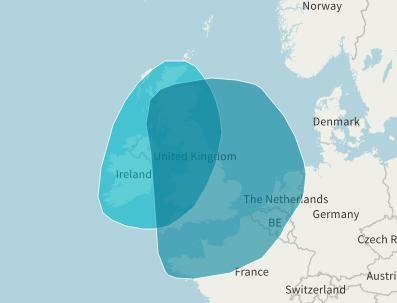 So yes I have done some digging, and Nancy Bird's tree - as near as I can figure -looks like this. 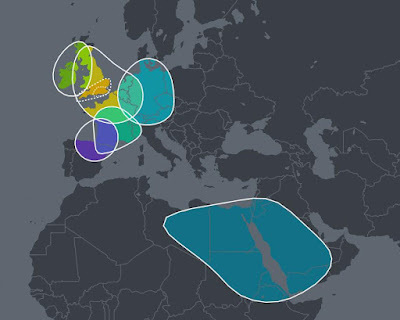 So really the question is not "Are we related to Nancy Bird" it is "Are we related to James Bird?" "Well Nana says so but I am not sure how"
Every New Year I make the same resolution - I resolve to be more organised. To actually start writing things down, to stop relying on my often scattered memory (thanks thyroid) and to be a better correspondent (ie actually reply to people, instead of just thinking I have). I can't guarantee that this resolution will stick this time because I really am rather terrible at it but I have started yet another Notebook to substitute for my brain and 3 days in to 2017 am still remembering to write down ALL THE THINGS, so chances are if you contact me within the next week you may actually get a response. 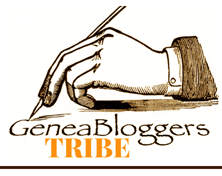 Hey I may even manage more than 4 blog posts a year if I actually get organised in my research (and stop being a post work zombie)! 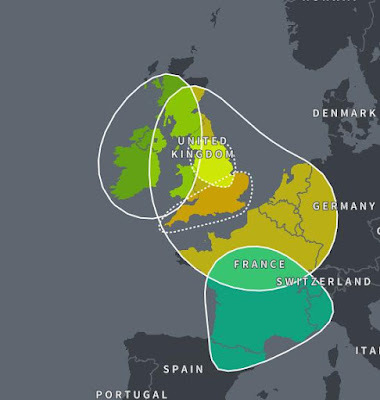 This time of my paternal ancestry. I threw the kit at Dad and told him to spit. The German on Dad's maternal side makes all the difference it seems. 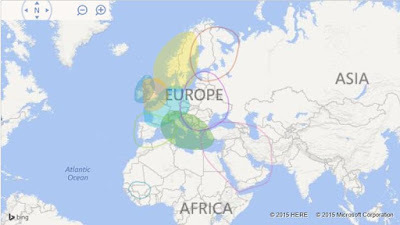 What did surprise me is how similar mine and Dad's FTDNA maps are. 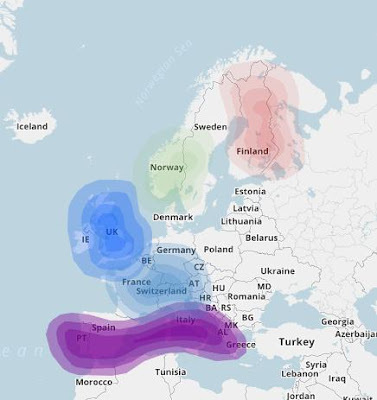 The southern European that I assumed must all be from my maternal side; seems to reflect what I am guessing may be from Dad's maternal as well. I think I may have to throw my other half's science brain at the problem because numerical data analysis is not my strong suit. I have mentioned before that the Sinclair branch of my family tree has links to a certain iconic Australian biscuit maker, but it seems that same branch also has links to another iconic Australian. Well, at least according to a footnote in this book. 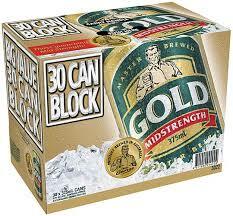 So there you go, Arnotts & Tooheys. Biscuits & Beer.